Returning to LACMA after it's installation during 2013's nationwide retrospective, the sensory immersion experience "Light Reinfall" is one in the series of Perceptual Cells by American Southwest artist, James Turrell. In the intimacy of it's confines, the viewer is presented a profound observation on optics and via the artist's exacting manipulation of light and perceptual phenomena. Ultimately connected to a very personal, inward search for the place and role of consciousness, perception and reflection in the universe, Turrell’s body of work prompts consideration of the very nature of the sensory through a discipline of contemplation, patience, and meditation. Their experience can be seen as very literally lifting the ceiling off the traditional gallery, as discussed with The Guardian in their interview with the artist, "James Turrell has Taken Experiential Art to Surreal – Even Volcanic – New Heights". More than a decade has passes since the "Knowing Light" retrospective graced the Henry Art Museum, here in Seattle. As a wider introduction to Turrell's perceptual spaces, the experience establishing itself as one of the foremost modern art exhibits attended that decade. It's lasting impression even more deeply ingrained by having returned to the museum to further soak in the literally mind-altering luminosity of it's perceptual, hallucinogenic precision. Hosted at The Los Angeles County Museum of Art, The Museum of Fine Arts, Houston , and The Solomon R. Guggenheim Museum New York, the following 2013 nationwide retrospective featured in not one city, but three, with each representing different aspects from Turrell's body of work. Collectively the exhibitions producing an encompassing overview of the artist's singular realizations through the use of material, form, space, time and light. Hilarie M. Sheets encapsulated the significance of the nationwide overview by "Paying Homage to James Turrell, Who Turns Light Into Art" and a major, nine page feature in the New York Times Sunday magazine "How James Turrell Knocked the Art World Off Its Feet", while Amy Abrams gets to the fundamentals of "How We See", for Art in America. Concurrently at LACMA, Random International's "Rain Room", which had it's premier at the The Barbican London, as another in the series of the collaborative studio's work with composer Max Richter and choreographer Wayne McGregor. The work then came stateside to MoMA's PS1 as part of "EXPO 1: New York" a series of environmental works on ecological challenges in the context of the economic and sociopolitical instability, by some of the major names in the world of the installation arts. These same names featured largely in Flavorwire's elementary, "Art Installations that Imitate Weather" highlighting work by Diller, Scofido & Renfro, Tokujin Yoshioka and Olafur Eliasson, who's monstrous "Weather Project" for the Tate Modern may stand as the new century's pinnacle of what can be done with scale and an enveloping atmospheric spacial experience. 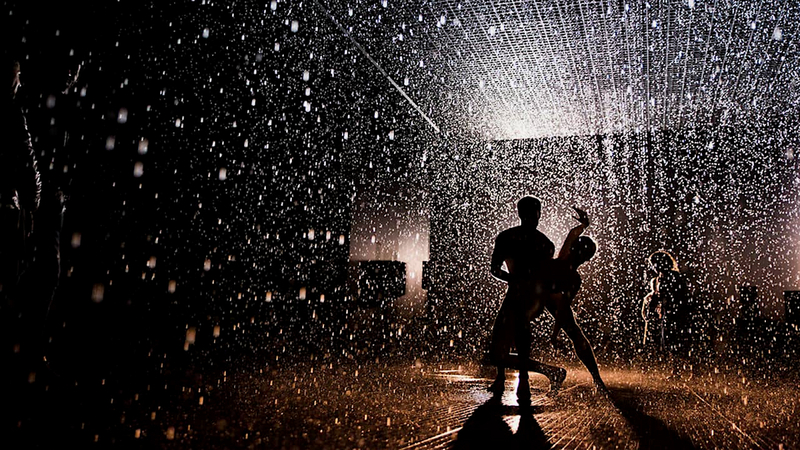 Generating a bit of a sensation, favorable press and public response to Random's time at PS1 was covered in The New York Times' "Steamy Wait Before a Walk in a Museum’s Rain", with it's current installation in Los Angeles featured by the LA Times, "Inside LACMA's Rain Room: An indoor Storm Where You Won't Get Wet". These being only recent additions in a string of years of strong work and press on Random International. Their "Future Self" for MADE was another in the series of successful installation and dance collaborations with Wayne McGregor and music by Max Richter. Following in rapid succession within the same year, the installation's premier at The Barbican was met with enthusiasm in the pages of the BBC and a glowing review from The Guardian. It's London run featuring a succession of live performances again by Wayne McGregor taking place within the installation over the course of the 2012 Frieze Art Fair. Next month Studio Wayne McGregor will be returning stateside for a brief series of domestic dates, including Seattle's Moore Theatre, performing "Atomos" in collaboration with A Winged Victory for the Sullen.